Italo Calvino argued that writing was a combinatorial exercise and that, for him, reading represented ‘a way of exercising the potentialities contained in the system of signs’. I would like to keep this declarative at the forefront of our investigation into the work of Terrance Houle, neither with a confirmative bias not leaning towards negating the statement of Calvino, but thinking through his statement in our analysis of a few of Houle’s images. I believe this will allow us to better understand how ideology influences our interpretation of the image, and broaden our investigation into the role, constitution and influence regionalism has on representations of culture within the Canadian Prairies. Terrance Houle’s performative, and performance-inspired works establish contiguities with the works of Lori Blondeau, Rebecca Belmore, Adrian Stimson, and other First Nations artists working in the Canadian plains. A Blackfoot artist, presently living in Calgary, Houle has exhibited his photographic, film and performance works internationally. His work flits with political and ideological presumptions about identity as is problematised through Canada’s history of colonisation. The works force a collision between the artist and the viewer which highlight Houle’s uncanny humour, while at the same time powerfully exposes the generational effect of ideology in the shaping of presumed identities. I see Houle’s performative gestures in the images below, as presenting a self-exiled identity, speaking about the condition of exile from the consciousness of nationhood. The work is capable of dissolving the contingent authority of the viewer’s gaze and inducing in the viewer a perverse instability of judgement. In the works below, Houle mimics a presumptive, racial representation, and he utilises an ironic perforce to weld his political intent. As with Stimson or Blondeau, Houle’s performative works represent a complex of discursive practices in which identity is a performative construction, substantiated by the gaze and assumptions of the viewer. As the image ‘End Trails / Trails End’ brings to the forefront the concept of putting cultures on display, or utilising displays of trauma for cultural purposes, this entails an inescapable history of barbarism, colonisation and oppression (and has been the growing concern of a number of Indigenous critics and curators). It is exactly these sentiments which Houle’s works evoke, in the unease he creates between the image and the viewer. Before delving into a further reading of the images, it would be helpful to position Houle’s ‘End Trails / Trails End’ (at left) against Calvino’s statement. In attempting to claw out the presumptive and assumed ideological views contained in the image, Houle forces the viewer to grasp for and then abandon centres of authority, preserving the subject in a shape-shifting polyvalence. Houle exposes the symbols of First Nations identity as semiotic objects, projecting historical power-relations, affecting and influencing First Nations identities, constituting the viewer’s ideological position, while also being constituted by the artist/subject. That the ‘Givn’r’ images depicts, as the ‘Urban Indian’ series before it, the artist dressed up in his regalia, performing mundane, everyday tasks such as going to the supermarket, riding the bus, etc. make the images a standpoint for the division between the culturally consumed images of Indigenous life and reality. The seeming impossibility of bridging these competing identities lies at the forefront of the Houle’s ‘End Trails / Trails End’. The image induces in the reader a Mobius strip of emotional attachment and discomfort, disturbing reaction after reaction, and displaying a causal unease with which First Nations signs and symbols contain potentialities of expression defined, in differing ways, by Indigenous and colonial cultures. Following on from the aptly name ‘Givn’r’ series (2004-2007) was Houle’s ‘Landscapes’. The landscapes in these photographs are punctuated by absence. 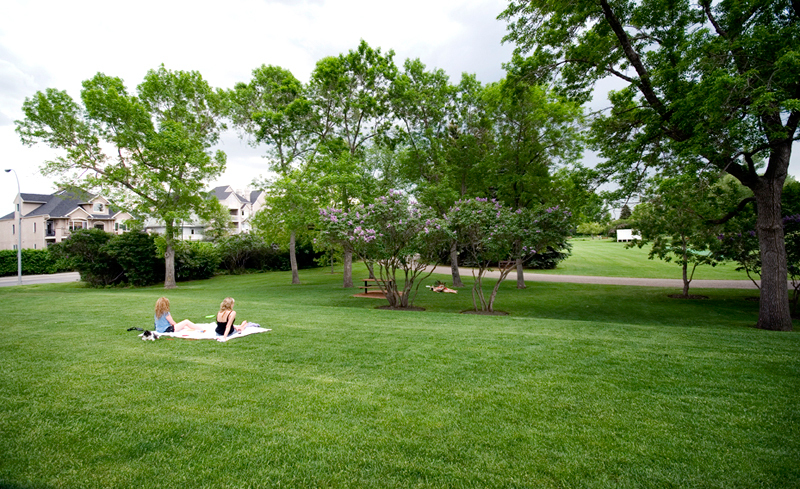 In the first image, friends sit idly on a picnic blanket in a urban park, lilac trees creep into bloom before them, McMansions are chartered in the photograph’s left margin, as the park’s small hills roll off into the background. Depicted is an afternoon of leisure: green corridors, and pastoral comforts which have been carefully stencilled in by the city planner’s hand, an appeal to a suburbanite crowd. In the first image, tucked between the lilac and the elm trees, appears a fallen Houle, clothed in regalia and headdress, prone and motionless. The dialect of care and control which sees a farmer’s field or a nature preserve carved into saleable suburbs is, under the same dictates, a dialectic which extends forward from the history of colonisation. 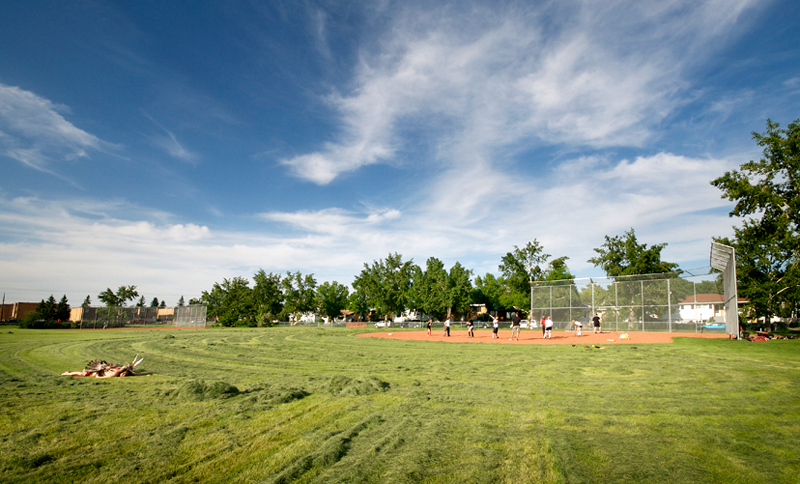 ‘Landscape #3’, depicts the same fallen Houle in the outfield of a baseball game, has the added implications of shielding natural degradation as well as cultural oppression behind a sporting motif (and an American sporting motif at that), and also readily depicts the exclusion and antipathy expressed at Indigenous suffering, even when it is at its most visible. This entry was posted in ARTWORKS, ESSAYS and tagged Adrian Stimson, Italo Calvino, Matthew Hall, Terrance Houle. Bookmark the permalink.